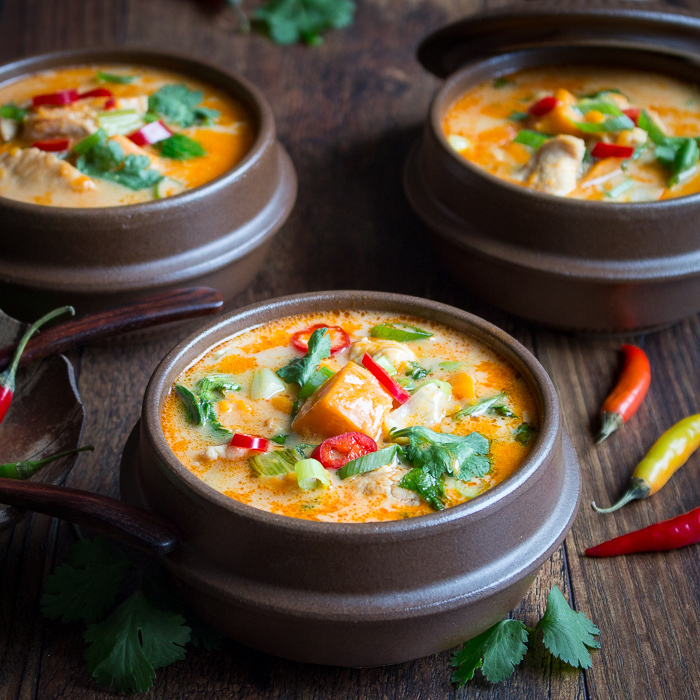 You are just to love this Creamy Thai Sweet Potato Chicken Soup because it is everything your body is craving. It’s a little spicy from the red curry paste, naturally sweet from the sweet potatoes, creamy from the coconut milk, nourishing from the gut loving bone broth and a little zip from the fresh lime. As with all Thai recipes, the balance of spicy, sweet, sour and savory notes complement each other. 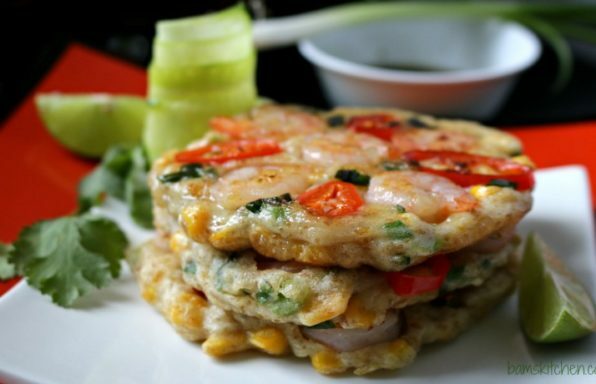 Hop on over and check out our Thai Cuisine Recipes for more quick and easy dinner inspiration. If you are feeling too lazy to cook, this Creamy Thai Sweet Potato Chicken Soup is just the recipe for you. Essentially, it is a quick chop, dump and forget about it kind of recipe. 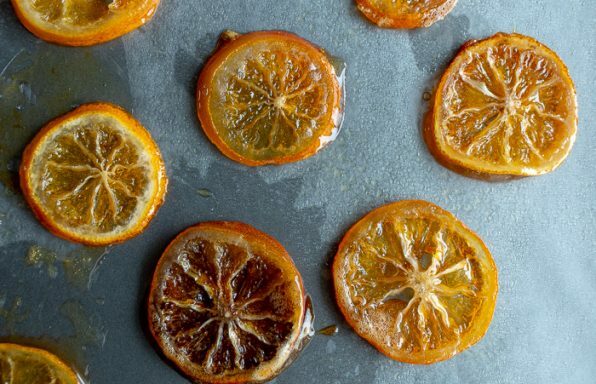 With the crazy busy back to school, work and life’s usual trials and tribulations, you need some easy recipes for your weeknights. We made our Creamy Thai Sweet Potato Chicken Soup in our instant pot and it was literally done in an instant. However, if you do not have an instant pot you can make it on the stove top in under 30 minutes. Really!!! 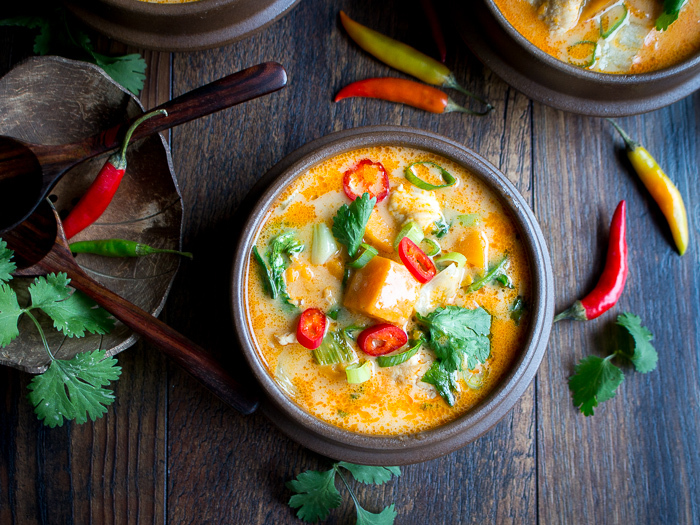 Why you need Creamy Thai Sweet Potato Chicken Soup in your life! 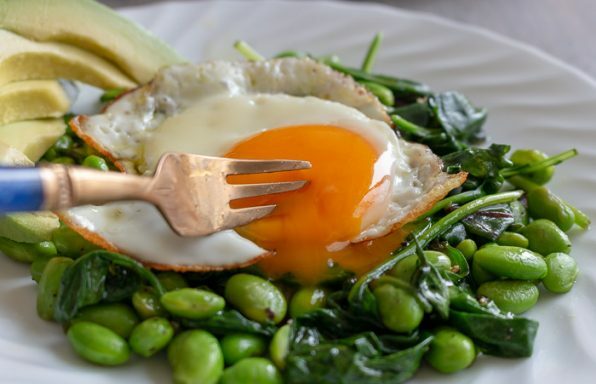 Unlike many quick and easy recipes, this one is tasty and Clean eating. Win-Win! A quick and easy Creamy Thai Sweet Potato Chicken Soup you can feel good about feeding yourself and your family. 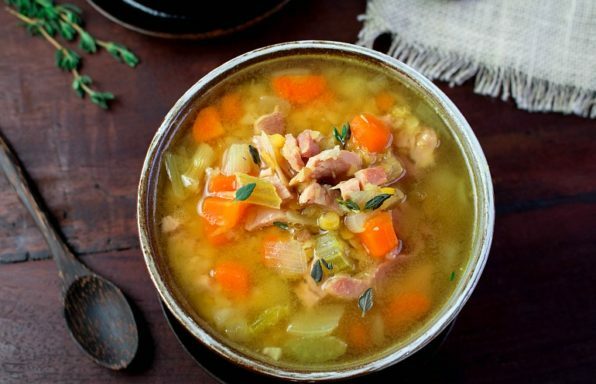 This soup is gluten-free, whole30 compliant, paleo friendly and dairy free. You gotta love that. The addition of the coconut milk at the end of the cooking process makes this soup extra creamy. 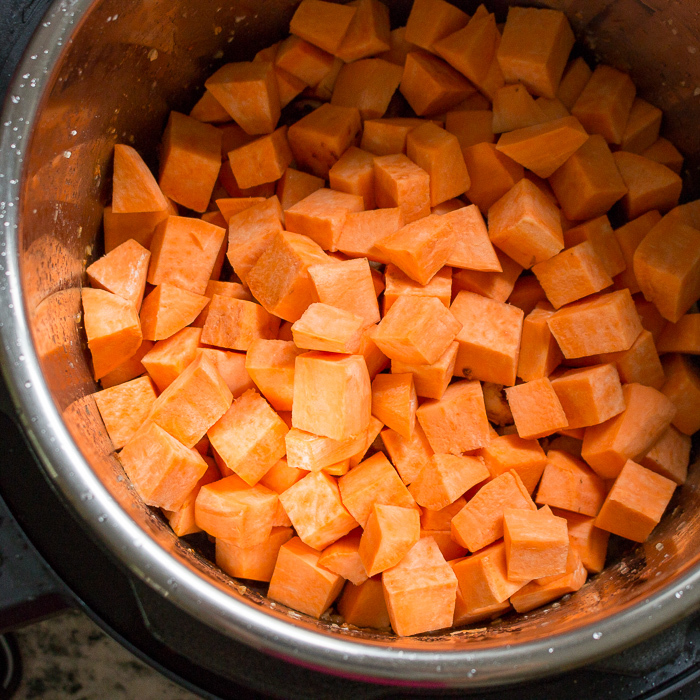 We pressure cooked our soup for 8 minutes with the chicken and sweet potatoes cut into ¾ inch cubes. We love it when the sweet potatoes emulsify into a delicious mash and thicken your soup when you just stir it. If you prefer your sweet potatoes firmer, pressure cook only for 5-6 minutes. 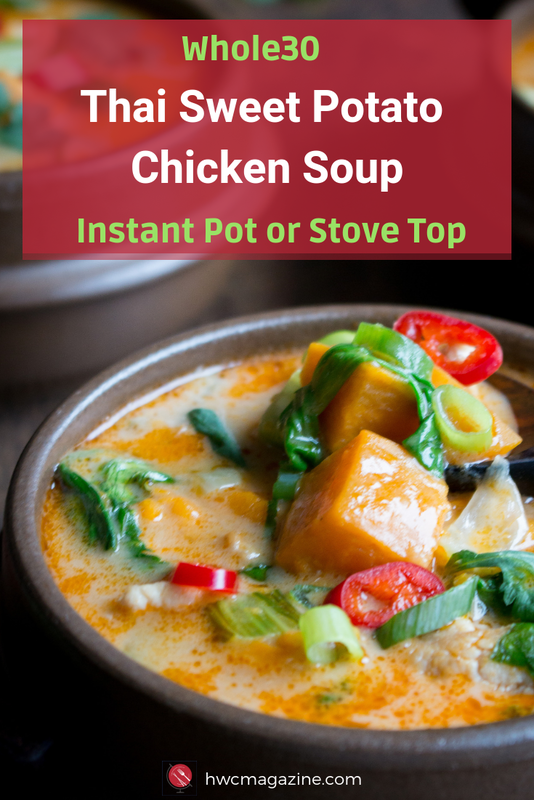 Do you want to make your Creamy Thai Sweet Potato Chicken Soup on the stove top? Just toss in a little coconut oil, garlic, ginger and red curry paste and cook your chicken until the juices run clear. Add your sweet potatoes to the pot and chicken bone broth and season with salt and pepper and cover and cook over a medium high heat for about 20 minutes until the sweet potatoes are fork tender. If you want to use a submersion blender for the sweet potatoes, remove the chicken from the pan after sautéing and set aside and cook sweet potatoes until fall apart tender. Blend the sweet potatoes with the coconut milk and add back into the pan with all the rest of your ingredients and allow the flavors to mingle. The change of seasons is a very important time to take extra good care of yourself. Have you had a chance to read our Feed Your Spleen; Nourish Your Body post? 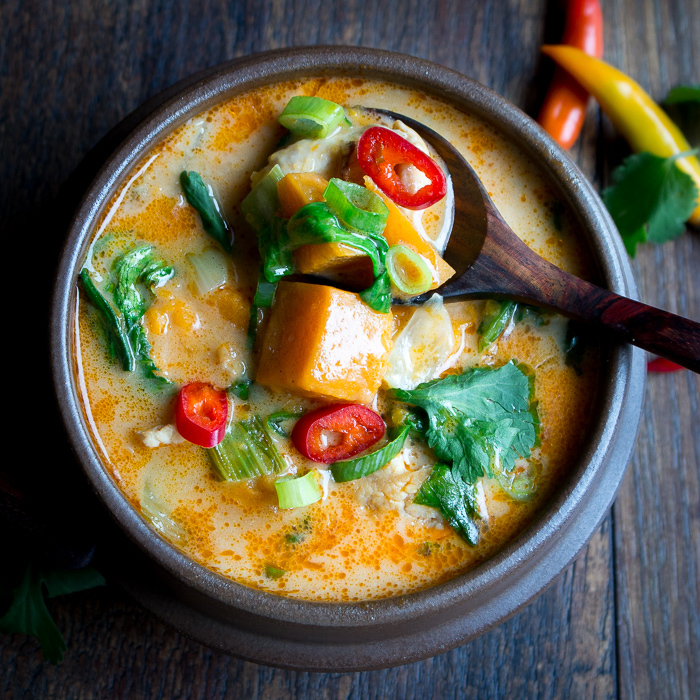 This Creamy Thai Sweet Potato Chicken Soup is a very nourishing soup for your body. After a long hot summer of way too many cold drinks, ice creams and raw foods our body needs to recuperate and regenerate. Warming and nourishing is what your body needs. There is nothing like a steamy bowl of homemade soup to cure what ails you. The temperature went from hotter than Hades to blustery cold in less than 24 hours. Our blood has gone thin living in Asia all those years and just throwing on a sweatshirt is just not going to cut it. When we get that cold, only warming soups, stews and teas are going to move our internal, can’t stop shivering, thermometer. We also have a few vegan/vegetarian soups you may be interested in like our Spicy Tomato Mung Bean Noodle Soup or our Roasted Butternut and Carrot Ginger Soup. 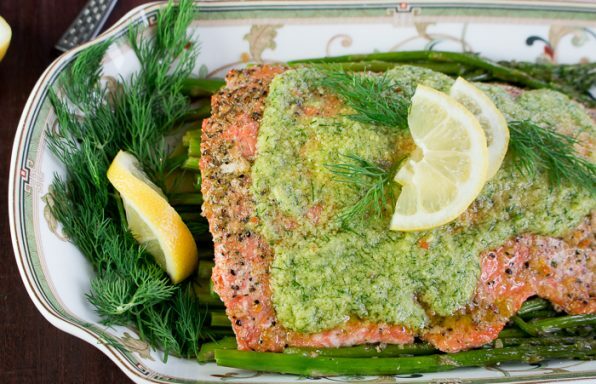 This easy dinner is a game changer! 1Turn your instant pot on to the sauté function on medium. Add coconut oil to instant pot, ginger, garlic and red pepper paste and sauté until aromatic. 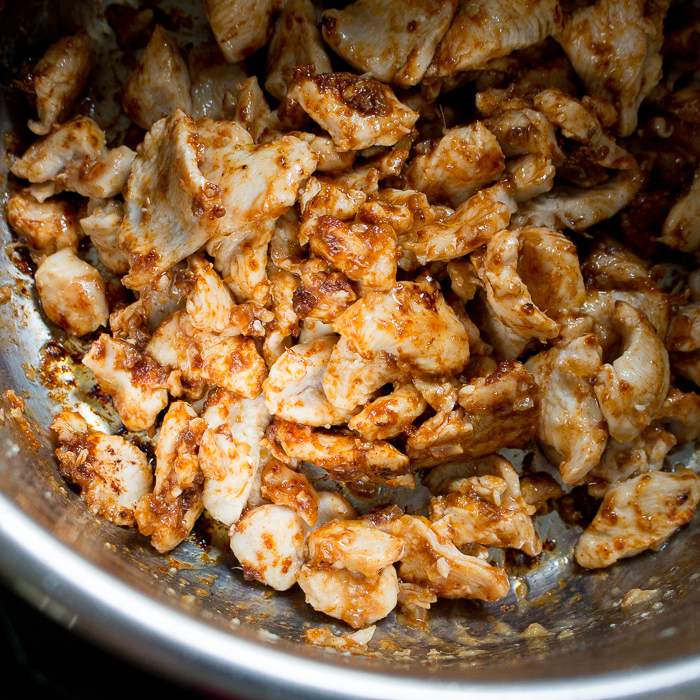 Add you chopped chicken and saute until juices run clear- about 5 minutes with the lid off. Turn the instant pot off. 3It can take anywhere from 10 minutes to 20 minutes for the pressure cooker to come to pressure. 4Once your pressure cooker timer has beeped and completed its cycle. Hit cancel button on the Instant Pot. Carefully perform the quick release function. Keep your face and eyes away from the steam release valve and with oven mittens and a towel open the steam release to allow the pressure and steam to release. 5After the steam release is complete and the float valve is lowered, it is safe to open the lid. If for some reason the float valve is still up and it is difficult to open the lid it is not ready yet. 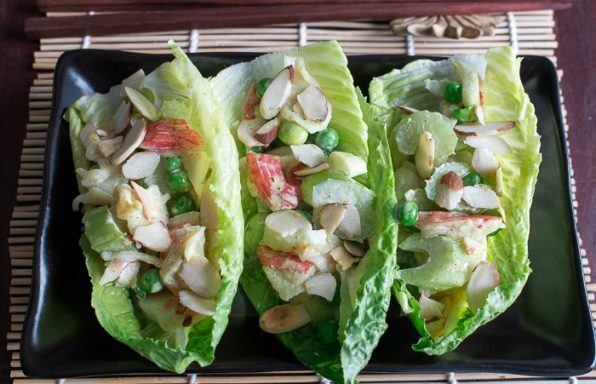 6Open the lid, add the tops of bok choy and the well shaken cans of coconut milk. Adjust seasoning as needed to fit your flavor profile. Place the instant pot on the sauté function just until the coconut milk is bubbly, stir gently. 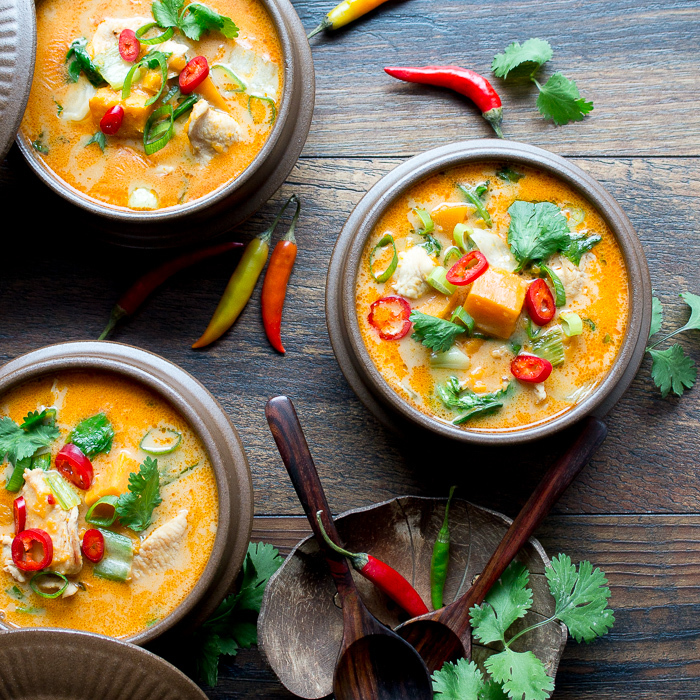 7Serve your Creamy Thai Sweet Potato Chicken Soup into bowls. Drizzle with a little lime juice and garnish with red chili and cilantro if desired. Enjoy! 1In a large pot add coconut oil, ginger, garlic and red pepper paste and sauté until aromatic. Add you chopped chicken and sauté until juices run clear- about 5 minutes with the lid off. 2Add chopped sweet potatoes, chicken bone broth and salt and pepper to taste and cook for about 20 minutes or until the sweet potatoes are fork tender. Add the bok choy, coconut milk and cook until the bok choy are tender. 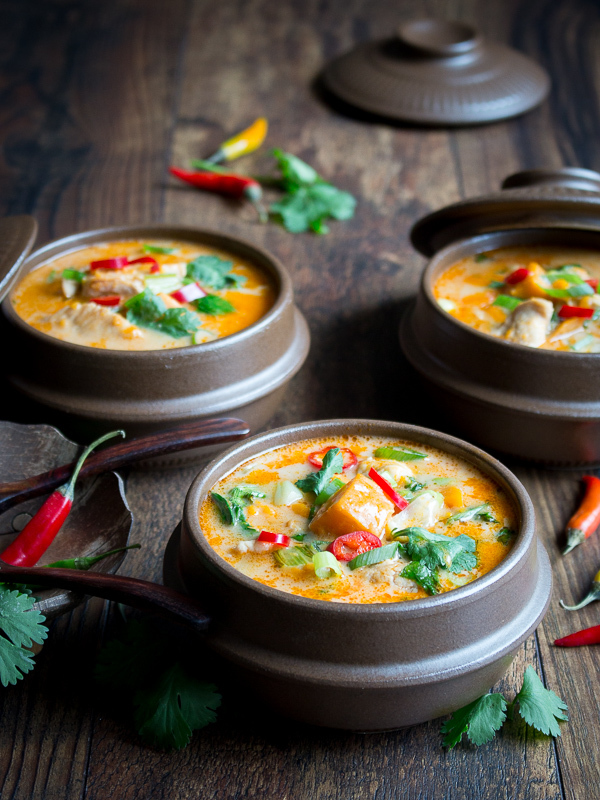 3Serve your Creamy Thai Sweet Potato Chicken Soup into bowls. Drizzle with a little lime juice and garnish with red chili and cilantro if desired. Enjoy!